Yeah, but now Lucario might not be there, so thats awesome. GET OUT OF HERE, POKEMEN. I hope to see Falco cut. And Lucas and Toon Link might be in trouble as well. What if they cut ALL of the Star Fox guys? You know, since its been like 14 years since a Star Fox game? @TriforceBun - Since Toon Link is now a stage character for the Spirit Tracks level, I'm not expecting him to turn up in playable form (unless he only appears on the Wii U version, and the 3DS version gets its own unique characters... they confirmed that the number of characters would be the same in both the Wii U version and 3DS version, but they didn't outright say that both games would have the same characters (though I'm completely expecting them to)). That's great! 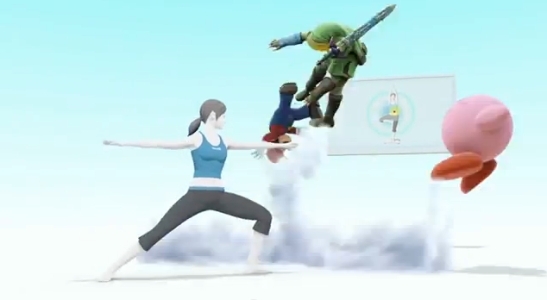 When I first heard the trainer was in Smash I was all "uhh..really? kind of a boring choice..." but that trailer was very convincing, she's pretty cool! That voice actress must be happy. Well, technically, Spirit Tracks Link is a different Link. I think it took place 100 years after Phantom Hourglass? @ploot - True, but if Smash's adult Link is an amalgam of multiple Links, you would expect the ST version of Toon Link to be folded into Smash's version of Toon Link too. Trying to analyze the game a little...does anyone think it looks faster than Brawl? It's hard to tell. I want to say that I think it absoLUTELY looks closer to Melee than Brawl, but it really is so hard to tell without having the game in my hands. Really wish this would be at Best Buy tomorrow! I really hope we get to keep Toon Link. Regular Link is too heavy for me. Toon Link feels sprier and more fun!